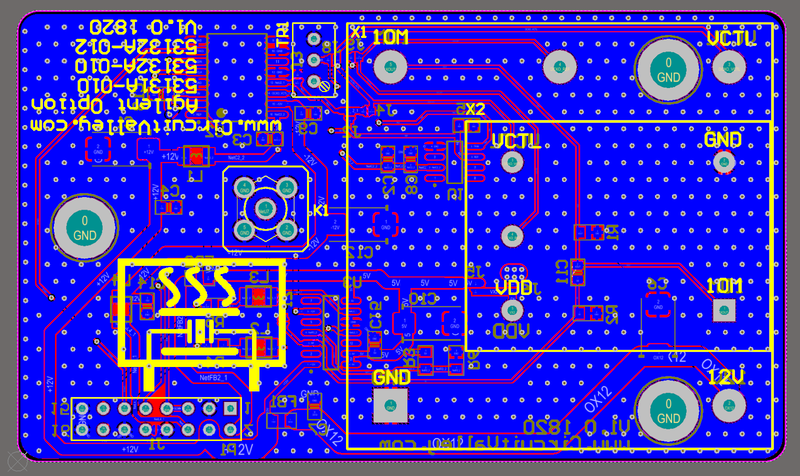 While i was working with my own GPSDO project. i need to have a frequency counter with descent stability so purchased my self a Agilent 53132A which is a 12 digit frequency counter , big brother to 53131A 10 Digit Counter. Both are really nice units. But they unusable standard Timebase. So optional oven oscillator time base need to purchase. but 53132A and 53131A both unit are no longer available for sale. and neither of the Time base upgrades. At first i decided to look around for time bases on online retail sites as already knew other people are selling them. But i had few doubts , how well the whole thing is put together. what kind of parts they have used? How good is oven they are using? and Are they using same parts as per the original Agilent time base? As it is quite normal for stuff listed on common online retail sites, It are quite cheaply made. and i found not even a single Time base who provides exact Bill of martial and give any specification details about the OCXO they are having. ofcourse OCXO is quite expensive so they all were using old OCXO which is totally fine but some data should be available. Overall i was not quite satisfied with the quality of the module available on online. 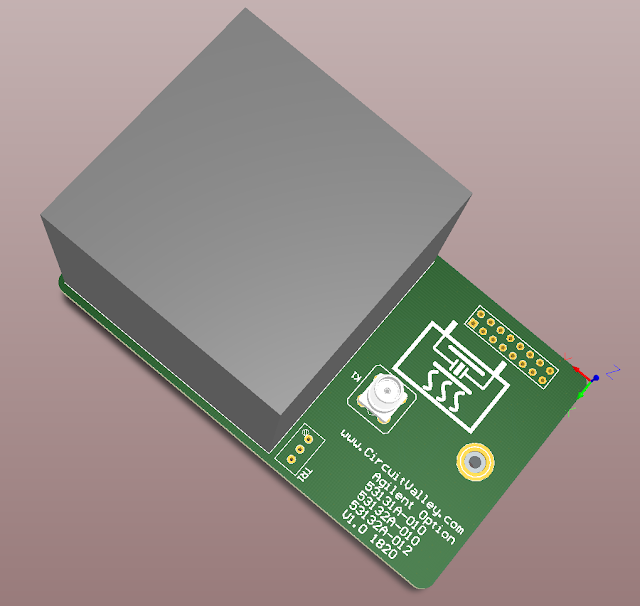 I did find few people who designed there own board but non of them were willing to give source of the PCB away and they were using electrolytic capacitors instead of tantalum, which i find a little odd in a part which get hot. 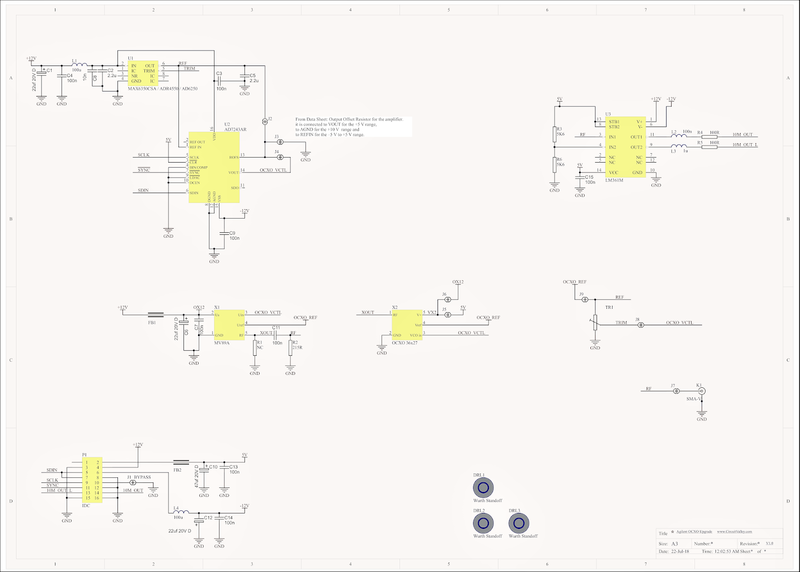 As 53132A/53131A component level specification is already in public domain so schematic is already available in document. so i decided to make 53132A OCXO Ultra stability Time base my self. most important part completely open source. As you can see there is not much in schematic , just few component , DAC to generate control voltage for OCXO, Reference for DAC, and a differential compactor to provide differential 10M output, few passive elements. as small 36mm x 27mm oscillator may need 12V or 5V power supply so you can switch power voltage using J6 and J5. 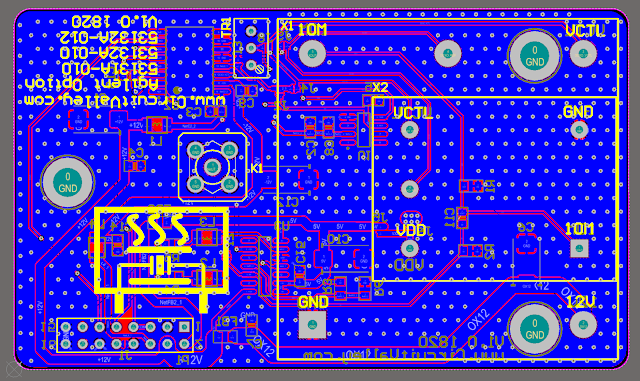 i also have lad pattern for trip pot which can be used to tune OCXO or to fine tune reference chip. so if you are not planing to use automatic calibration , you can skip many of the parts from the board and use pot to calibrate. J9 and J8 is used to switch between OCXO ctrl votage and reference chip fine tuning. when DAC and every thing else is populated one can use POT to fine tune reference chip. 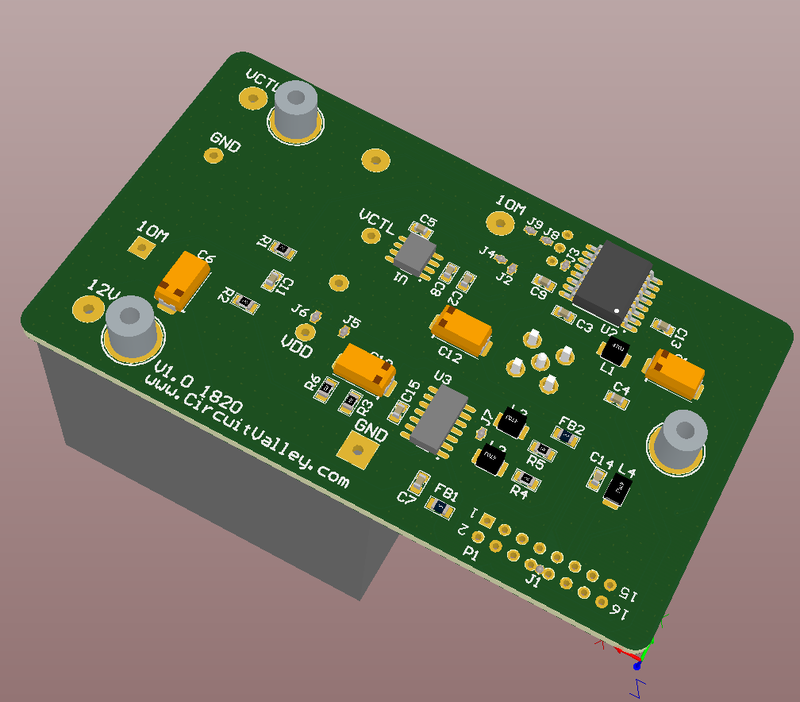 because with 12Bit dac you do not get much resolution in control voltage. I have installed ocxo in in my 53132A and used my own GPSDO to calibrate it. here the viedo explanation. can I use this module with 53181A? I am an Electronics/Software Design Engineer. Anybody have questions about Embedded system design and software system design may ask questions here. if you have custom project in mind please ask for quote. If you find all of these things useful and want to Please donate me few bucks through paypal . it will help me to keep this up!!! Copyright CircuitValley. Powered by Blogger.